Top 10 Gardening Tips you won’t want to miss! Home > Insurance Blog > 10 Top Gardening Tips you won’t want to miss! 10 Top Gardening Tips you won’t want to miss! Nothing is better than a gorgeous summer garden. Here are some top tips to get you growing in no time! Don’t worry about finding the “perfect” spot in your backyard, instead, start with a small garden container! You’re more likely to be successful with your garden if it is placed near a door or window you use often. The easier it is to get to the garden, the easier it is to get good, fresh produce out of it. Also, start small, and work your way up to a bigger garden. Fun tip: a Rubbermaid storage container is the perfect container to get you going. Drill holes in the bottom, add packing peanuts and a layer of garden fabric to create proper drainage. Tutorial found here. It’s easy to start your garden off with quality “tools.” A garden should have good soil and drainage, which means plenty of compost! Composting is easy: save your food waste (things like egg shells, coffee grinds, and apple cores are perfect) so that it’ll become the perfect plant food. For more tips on composting, visit this website. Some plants prefer shade, some prefer sun, and some are easy going and aren’t partial to either. Don’t overlook this part of the plant’s description: the right amount of sunlight could determine the success of your plant. Fun tip: place your container garden on wheels or a small cart so that you can move it around in the event that your selected spot doesn’t get the amount of sunlight you expected! If you want succeed with your garden you need to plant the right type of plants, at the right time. You can check both at the United States Department of Agriculture’s plant hardiness zone map. When you’re sure that your plants will grow in your zone, make sure you plant them at the right time of year! Some plants are just easier to grow than others. For easy-to-grow produce, lean towards tomatoes, peppers, onions, chard, basil, and bush beans. Clematis, sunflowers, dahlia’s, foxglove, roses, and black eyed susan’s are all easy flowers to grow. Make sure you give young plants plenty of water, but always avoid wetting the plant’s leaves! Wet leaves can easily lead to mold, rot, and a sick plant! As your sprouts grow, remember that the general rule of thumb is to give plants an inch of water per week. Be on the look-out for yellow leaves that means too much water! Animals seem to think that your garden becomes their personal oasis as it grows. To keep them from eating your lettuce or stealing your strawberries, strategically place a few plastic forks (pointy side up!) around your plants to deter them from destroying your fresh produce. Epsom salt has an abundance of uses, including producing a healthy garden. It is rich in magnesium sulfate, which is crucial to plant life. For potted or potted plants, mix a couple of tablespoons of the salt into your watering can once or twice a month. You can also sprinkle it in your garden’s soil to help your seeds germinate better. Add a tablespoon or so in with the soil when first planting, and then sprinkle more into the soil once mature. 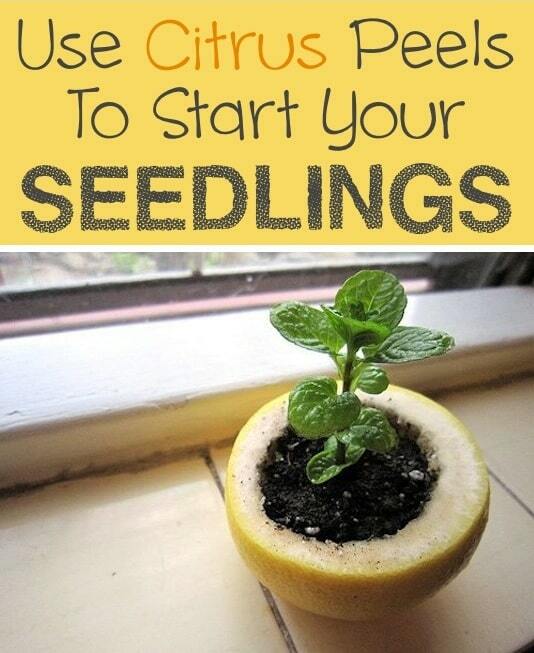 Start your seedlings in a citrus peel! Not only is it more appealing than typical methods, but it will also compost in the soil and nourish the plants. Just don’t forget to poke a hole in the bottom for proper drainage. Example shown here! Do you ever have an indoor plant that keeps losing soil every time you water it? Place a coffee filter at the bottom of your flower pot before you fill it with dirt. This will hold the dirt in while allowing the water to drain though, without all the mess! Listotic.com shows how to do it here. Tips found from KGI.org, HGTV, and more.